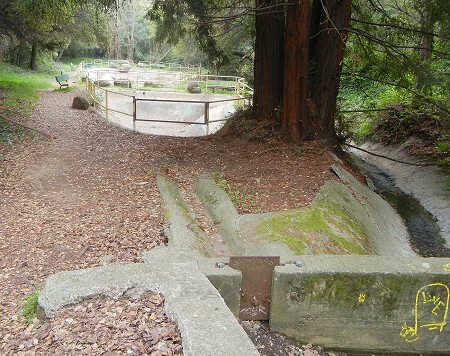 A while ago I featured the casting ponds at McCrea Memorial Park, in the valley of upper Lion Creek. I didn’t poke further downstream at the time, but since then I have. The creek runs alongside a pair of small concrete “trout ponds,” cunningly made with cobble-lined runnels that would send a lifegiving trickle through them if there was enough streamflow, which there isn’t, to sustain fish, which there aren’t any of. The lower pond did have enough water in it to interest a mallard couple. The male kept watch on me as the female gorged on duckweed. 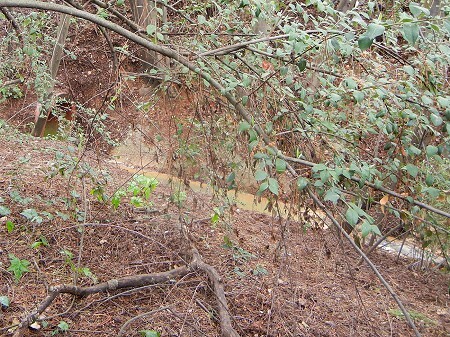 To the left of that photo, just over a low ridge and behind a fence, the iron-stained waters of Sulfur Mine creek exit a pipe. Farther down, it joins Lion Creek and the combined watercourse enters a tunnel beneath the Warren Freeway. I haven’t gone into it, but people clearly do. If you cross the freeway on the little-used pedestrian overpass, you might expect to find the creek on the other side. Instead you’ll see Horseshoe Creek coming out of its canyon in Leona Heights Park and entering its own final conduit. Where the two creeks meet must once have been a cheerful place. Today it must be a black and dismal one, visited only by rare daredevils. 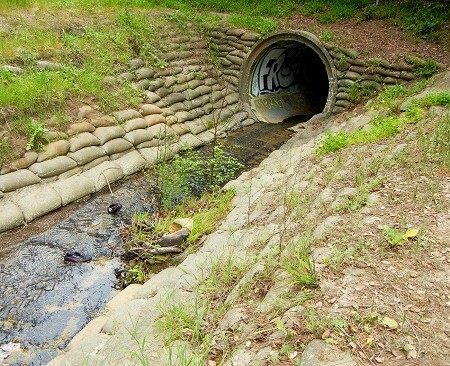 If the tunnels aren’t screened, perhaps they can crawl all the way down to where Lion Creek reemerges, at Lake Aliso at Mills College, in a wretched feat of urban spelunking. 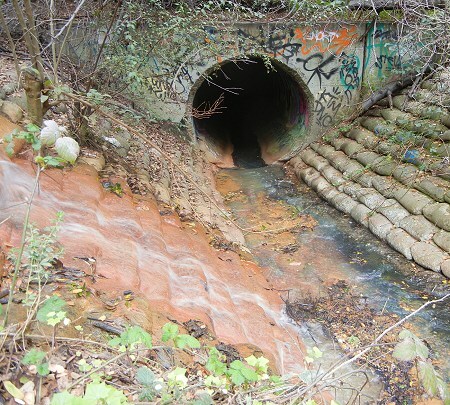 This entry was posted on 17 March 2015 at 5:15 pm and is filed under Oakland streams and water. You can follow any responses to this entry through the RSS 2.0 feed. You can skip to the end and leave a response. Pinging is currently not allowed. This is very amazing. I will have to go visit McCrea Memorial Park someday myself.